Bench Clothing has revealed the line-up of celebrity models who will participate in the Philippine Fashion Week Holiday 2011 scheduled on May 8, 6 PM, at the SMX Convention Center Halls 1 & 2, Seashell Lane, Mall of Asia Complex. A total of 40 Bench celebrity models will walk the fashion ramp this May 8 and leading the pack of hunks who you love to see modeling for Bench are Diether Ocampo (who is always present whenever there is a Bench fashion show), Dingdong Dantes, Piolo Pascual, Zanjoe Marudo, Gerald Anderson, Coco Martin, Rafael Rosell, Jake Cuenca and many more. Nice to see Azkals' Fil-European player Mark McMahon being part of the line-up as one of the newest Bench models. You'll love him more after the fashion show. 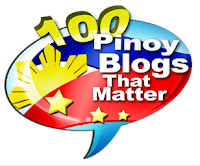 I'm sure AJ Perez, who was also a Bench model before he died, was supposed to be part of the Bench Fashion Show in the Philippine Fashion Week Holiday 2011. He's one of the newest Bench models introduced this year along with his "Sabel" co-star Joseph Marco who, as you can see, is part of the line-up in the PFW Holiday 2011. Had it been AJ is still alive, this upcoming Bench show in the PFW will be AJ's first fashion show for Bench. 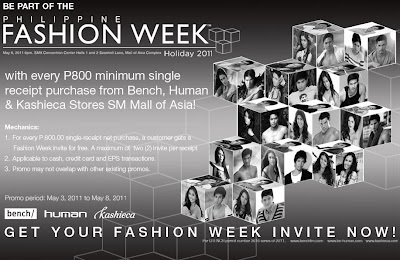 Want invites for the Bench event in the Philippine Fashion Week Holiday 2011? The promo has started yesterday, May 3, and will end on May 8. The Bench, Human, Kaschieca Fashion event on May 8 is the first event in the Philippine Fashion Week Holiday 2011, which runs from May 8 until May 15.